A memorandum from the French Military Intelligence District, titled “People under the threat of bombs”, confirmed that French air, land and sea weapons were used in the Saudi aggression against Yemen. The memo showed that Riyadh and Abu Dhabi used these weapons. It also pointed out the presence of French planes, tanks, artillery and warships in the hands of the Saudi aggression countries. France has always openly called for the protection of civilians in Yemen, yet at the same time it secretly armed Saudi Arabia and the United Arab Emirates to fight Yemenis and kill them with their weapons. The memo noted that France provides land, air and sea support to Saudi Arabia and the United Arab Emirates in their war against Yemenis, asserting that forty-eight Cessar cannons manufactured by the French company “Nexter” are deployed along the Saudi-Yemeni border to support them during their advance in Yemeni territory. On the battlefield, the Locklear tanks sold to the UAE were recorded in the 1990s, with fifty-five Yemeni civilians killed in the battle of Hodeidah in November, according to the US NGO “ACLID”. In the air, the memo stated that the Mirage Alfa-9 aircraft are operating in Yemen, as well as the use of the French raid guidance “Democles” in this war also according to the District of French Military Intelligence. At sea, the memo showed that two French-made vessels were involved in the maritime blockade, which was hampering the supply of essential materials to the population, one of which contributed to the support of land operations on Yemeni territory. French military intelligence revealed in a confidential letter to the authorities that French weapons are used by Saudi Arabia and the United Arab Emirates in the aggression against Yemen, which is contrary to the story of the Secretary of the Armed Forces, Florence Barley, which denied that French weapons are present in the aggression against Yemen. The site “Discluz” and radio station “France Radio”, spoke on Monday that a secret 15-page French military intelligence report, written in September 2018, speaks of the use of French weapons by Saudi Arabia and the United Arab Emirates in the Yemeni war. “Saudi Arabia and the United Arab Emirates are using several types of weapons that they have already bought from France in its war against Yemen,” the French military intelligence said in its report. Among the weapons mentioned in the report were the Leclerc tanks, the Dassault Mirage 2000 fighter aircraft, the Cobra radar defense system, the Cougar-Duvain helicopters, as well as frigates, cannons and other weapons. In the context of the report, French military intelligence published a map showing the sensitive areas of Yemen, where a large number of civilians are present and where battles are taking place in which French guns are used. According to the site “Discluz” and radio station “France Radio”, on October 3, 2018, the French military intelligence sent its report entitled “Yemen .. the security situation” to the President of the Republic, the Minister of Armies, the Minister of Foreign Affairs and the government during the Mini Defense Council held about the war in Yemen. “Arms sold by France to Saudi Arabia and the UAE are used exclusively for defensive purposes and the situation is under control,” Minister Barley said in January. However, the French military intelligence report said that “Saudi Arabia has deployed 48 French cannons of the type (Cesar) along the border with Yemen and that the mission of these guns is the bombing of targets within the territory of Yemen to allow loyal forces backed by Saudi forces to advance in its attack, which means that the use of guns is not defensive but rather offensive. In an indirect way, according to the French media, the intelligence warned of the consequences of the use of French weapons in Yemen for civilian casualties. Regarding this subject, French military intelligence, in the context of its report, published a map under the title (civilians under the threat of bombs), which showed that 436,370 civilians are in areas threatened by French fire. 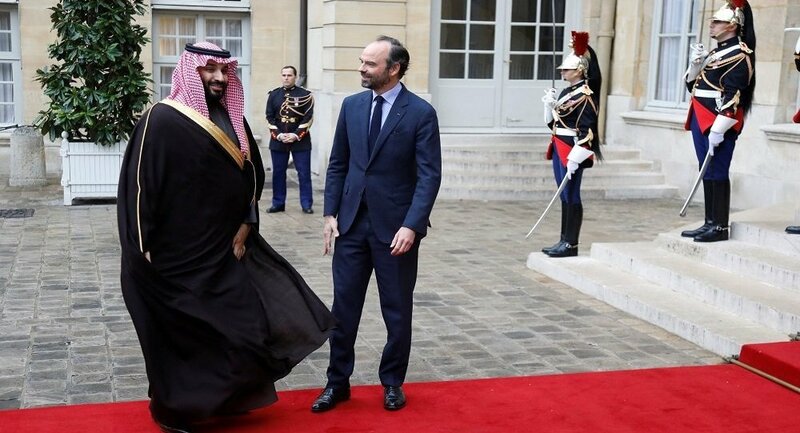 Despite the French military intelligence report, “France still sells arms to Saudi Arabia.” According to the site “Discluz” and radio station “France Radio”, it is expected that France will send 147 guns to Saudi Arabia by 2023 and is also expected to send armored vehicles under a secret deal signed in December 2018. According to the French report, the Saudi-led coalition forces are using two ships from a French industry in the naval blockade, which is contrary to the French position on the blockade. The French are in the front line of the Saudi and UAE war on Yemen. Since March 2015, five Rafal aircraft have been involved in the reconnaissance of Yemeni sites, from the UAE base of Dhafra and from a base in Djibouti. France has also provided satellite images of Yemeni sites for Emiratis and Saudis since the beginning of the war, and even Paris has fought the war against Yemenis since 2009. When the United States refused a Saudi request that year to intervene against the penetration of Ansarullah from Saada to Jebel Dukhan in Asir, Nicolas Sarkozy rushed to replace the Americans and to help his helicopters at the base of Djibouti to attack Ansarullah while images of French satellites were revealed guiding the Saudis to the ravages. This French rescue was not the first time that the French replaced the rejecting Americans and acted as opportunistic hunters to gain some diplomatic and commercial gains. Since the days of the French, the French once again replaces the place of the Americans in the rescue of the UAE and Saudi Arabia, and in the operation «Hodeidah» after they rejected a UAE application to provide them with intelligence and air capabilities, reconnaissance and dismantling explosive devices in a process that requires technical and human capabilities that the Saudi-led coalition can not advance. Nothing stopped France from selling arms to the Saudi and UAE allies to be used in Yemeni fronts, not even the dozens of massacres committed by the coalition in Yemen over the past three years, nor did France itself sign a year before the war on the arms embargo, which could be used to violate human rights. The French continued to extradite the Saudis in particular to the laser-guided Thalis missiles, which were widely used in Yemeni cities, especially in the early stages of operations in March and April 2015. The 155-mm “Caesar” cannon was also modified and supplied to the Saudis. A year after the outbreak of the war, six Airbus 330-200s were used to supply Saudi F-15 fighter jets in the air during operations in Yemen, as well as unmanned aerial vehicles (UAVs) and KOGAR helicopters manufactured by the European Manufacturing Commission. France received 900 million euros in the second half of 2015 for munitions and ammunition used by Saudis in the early months. The French eventually slipped from a mere arms seller into a participant in the blockade. In March 2016, when part of the Saudi blockade fleet entered the maintenance yards, French ships replaced them in surveillance operations under a signed agreement with the French Shipbuilding Authority. Moreover, thirty-nine French speedboats, delivered during the same period, entered the siege patrols. During the same year, France completed the transfer of the three billion dollars to arm the Lebanese army, scheduled for 2014 after its abolition, and adapting it to Saudi operations in Yemen. Ninety percent of the donated weapons were delivered in Riyadh, and the 276 armored Rino Sherpa, which the Lebanese army was waiting for, entered the military operations against Yemen. Can de-mining be a humanitarian action in the context of breaking into Hodeidah and removing part of the maritime defense line from the city and opening sea lanes to the port for UAE and Saudi ships and barges, under the pretext of facilitating the navigation and transport vessels to be supervised by these barges? The French offer the demining process as a “humanitarian” operation outside the military context, while such a situation requires, in the French case, the construction of a specialized demining force, led by an independent staff. There is talk of the deployment of the 13th and 21st Armies of the French engineering corps, which has gained considerable experience in demining for its participation in the war in Mali. The mobilization of all of these requires the dispatch of a multi-tasking frigate in a continuous military area with a crew of ninety sailors and a fighter to protect the demining teams. It is certain that the “humanitarian” operation is only the facade of a broad military operation.Beyond the military structure dictated by the nature of the mission, there is more than a political motive and arms deals for further French engagement in the war alongside Saudi Arabia and the UAE. The weight of the common interests of France, Saudi Arabia and the United Arab Emirates ruled the decision to go to engage in the war since its early hours, and reached arms deals with Saudi alone to more than $ 16 billion between 2010 and 2016. The special relationship between President Emmanuel Makron and the Abu Dhabi Crown Prince has played a role in pushing for more French involvement in Yemen alongside the UAE friend.The participation in the war against Yemen, despite the French keenness to enter it without any noise, is only the result of sharing one goal with the UAE and the United States.